Energy is crucial for the mankind and must be provided when and where needed to avoid serious hazards to societies. Among all forms of energy, electricity seems bound to play an increasingly central role, particularly in Europe. More and more shares of EU's energy are expected to be converted into electricity, particularly in the transport, heating and services demand sectors. Electricity security, which has to do with the power system's capability to deliver energy to the users, represents a crucial concern for policy decision making at all levels. The perceived worth of the reliability of the energy system can be used for assessing the economic convenience of future improvements, e.g. infrastructure investments, or to assess the damages caused by disruptions. the EU internal energy market is expected to be integrated and resilient; the promotion of energy efficiency and domestic energy production, would foster the reduction of energy import dependency. Against this background, we assess several facets of electricity security. A compilation of our activities and products in the field is reported below. We have been supporting the definition and conception of the power system risk preparedness proposal. By proposing EU-wide rules to follow in case of crises, the Commission intends to bolster regional cooperation and assistance among Member States. This approach can be less costly, more secure and strengthen the functioning of electricity market. 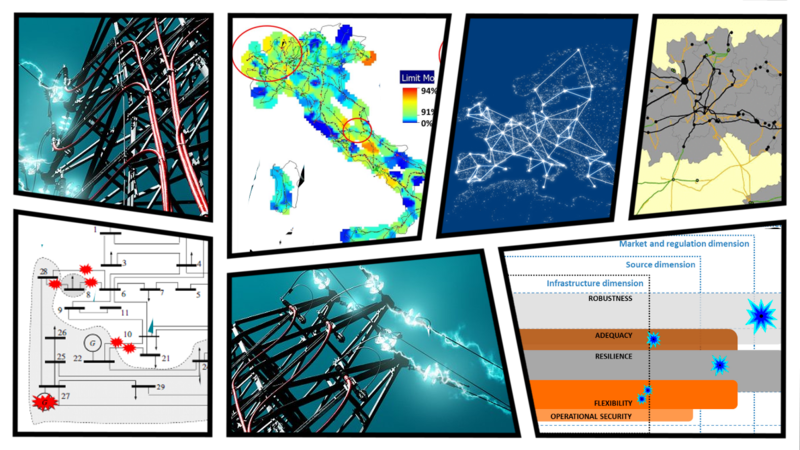 We study how the electricity security decision-analytic framework is currently structured and can potentially evolve. More information on our understanding of electricity security is available here. We perform studies on the societal appreciation of energy security. The Value of Lost Load (VoLL) is an indicator of the economic value that consumers place on the energy not served in case of a supply disruption, e.g. an electricity outage (blackout). VoLL is broadly used by industry and regulators for benchmarking the operating conditions of an energy system. We assess the main methods used to produce estimates of the Value of Lost Load for different types of consumers. Furthermore we provide estimates on the Value of Lost Load of electricity supply for households in several EU countries and regions. We assess the power system resilience and recovery performances after adverse events such as natural hazards. This report first presents the main methods used to produce estimates of the Value of Lost Load (VoLL) for different types of consumers. Then it provides estimates on the VoLL of electricity supply for households in three countries: Estonia, the Netherlands and Portugal. These three EU member states enjoy different levels of security of energy supply, which can be characterised as (relatively) high for the Netherlands, medium for Portugal, and low for Estonia. These different levels of security of supply are important in the context of the results. The authors designed two surveys, covering different aspects connected with security of energy supply, applying comparable econometric analyses to survey data from the three countries. A statistically representative sample of households from the three countries assessed scenarios of a blackout through a discrete choice experiment (DCE). This report illustrates the methodologies incorporated for the DCE and the subsequent results. In particular, we estimated the households' willingness-to-accept (WTA) a larger number or duration of power cuts and what compensation would be required, as well as their willingness-to-pay (WTP) to avoid such outages, in monetary terms. The report presents the results of a multicountry survey providing qualitative and quantitative information on the level of appreciation of customers and of regulators, suppliers and other key actors involved in electricity markets. The survey was conducted in Estonia, the Netherlands and Portugal. The responses show that the fuel mix for supporting space heating and cooling, cooking and water heating differs across countries. Thus, the inconveniences from disruptions of electricity supply can substantially differ among the three countries. 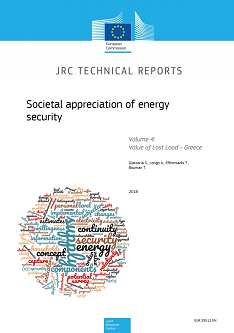 We also find that individual values significantly contribute to explain, alongside more common socio-economic and demographic individual traits, the propensity of residential energy users towards smart home technologies and acceptance of strategies to improve security of energy supply. Respondents have been also asked to evaluate their willingness to support a EU roadmap for energy security. Estimated benefits of a long-term strategy for energy security differ by country. In particular, the willingness-to-pay through increases in the energy bill is 39.04 euros in Estonia, 50.97 euros in the Netherlands, and 42.14 euros in Portugal. The availability and continuity of energy supply play a key role in qualifying the energy security of a country. This report explores the meaning of energy security, according to the perceptions and preferences of a broad range of market actors. Making use of interviews and survey data taken in Estonia, the Netherlands and Portugal, the importance of an encompassing set of policy topics/measures is explored and described to investigate the relevance of different dimensions of energy security. The perspectives of residential, industrial and commercial energy users, Distribution System Operators, electricity retailers and producers are analysed rating and ranking the relevance of policy components of energy security. The study provides a snapshot of potential gaps and discrepancies among the views of different categories of market actors and compares information on their beliefs and preferences with those stated by households and the other market actors. This enables to identify any consensus on the different components of energy security. This report presents the results of a study on the Value of Lost Load (VoLL) in Greece for various scenarios of interruptions of power supply. The VoLL is the value of unserved energy, and quantifies the value of damages perceived by energy users, in case of a blackout. The VoLL is used as a proxy of the economic value of reliability or alternatively of the social costs of power outages. The study involved two surveys: one on a random sample of 1500 households, completed via web and telephone interviews, and a second on a random sample of 750 non-residential customers included industrial, commercial and small medium enterprises participating in telephone interviews. VoLL is a latent unobservable variable and is influenced by characteristics of the consumers. In the literature on the monetary valuation of VoLL, a common approach is to consider the variation in well-being of consumers comparing the two conditions (with/without electricity supply). The value of the damage, in this methodological framework, is represented by the consumers' willingness-to-pay (WTP) to avoid the interruptions, and by the willingness-to-accept (WTA) compensations for the inconveniences of the interruptions. This study analyses the performance of the power grid during 16 earthquakes, 15 space weather events and 20 floods. It concludes that different natural hazards affect the power grid in different ways. Earthquakes cause inertial damage to heavy equipment and brittle items, and ground failure and soil liquefaction can be devastating to electric infrastructure assets. Recovery time is driven by the balance of repairs and capabilities. Poor access to damaged facilities, due to landslides or traffic congestion, can also delay repairs. In this study, recovery time ranged from a few hours to months, but more frequently from 1 to 4 days. Floods are commonly associated with power outages. Erosion due to the floodwaters and landslides triggered by floods undermine the foundations of transmission towers. Serious, and often explosive, damage may occur when electrified equipment comes in contact with water, while moisture and dirt intrusion require time-consuming repairs of inundated equipment. Recovery time was driven by the number of needed repairs, and site access, as repairs cannot start until floodwaters have receded. In this study, power was back online from 24 hours up to 3 weeks after the flood. However, longer recovery times (up to 5 weeks) were associated with floods spawned by hurricanes and storms. Space weather affects transmission and generation equipment through geomagnetically induced currents (GICs). In contrast to earthquakes and floods, GICs have the potential to impact the entire transmission network. Delayed effects and the potential for system-wide impact were the main drivers of recovery time in this study. When damage is limited to tripping of protective devices, restoration time is less than 24 hours. However, repairs of damaged equipment may take up to several months. 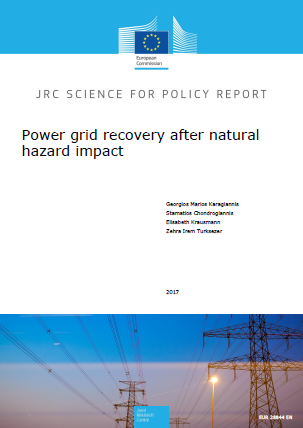 The study concludes with a number of recommendations related to policy, hazard mitigation and emergency management to reduce the risks of natural hazards to electric infrastructure and to improve crisis management in the aftermath of a natural disaster. 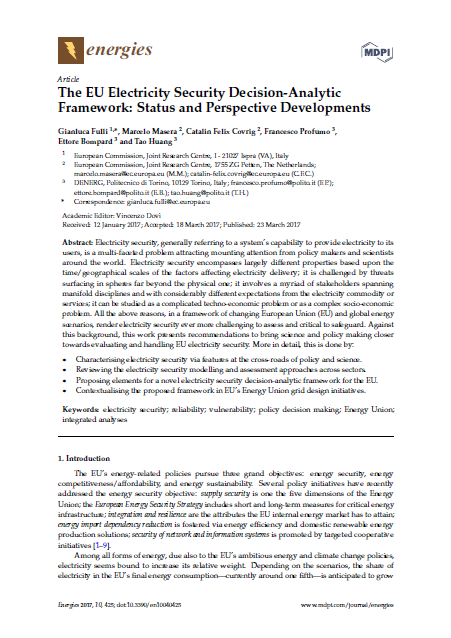 This paper presents recommendations to bring science and policy making closer towards evaluating and handling EU electricity security. Electricity security encompasses largely different properties based upon the time/geographical scales of the factors affecting electricity delivery; it is challenged by threats surfacing in spheres far beyond the physical one; it involves a myriad of stakeholders spanning manifold disciplines and with considerably different expectations from the electricity commodity or services; it can be studied as a complicated techno-economic problem or as a complex socio-economic problem. All the above reasons, in a framework of changing EU and global energy scenarios, render electricity security ever more challenging to assess and critical to safeguard. More in detail, this paper: Characterises electricity security via features at the cross-roads of policy and science. Reviews the electricity security modelling and assessment approaches across sectors. Proposes elements for a novel electricity security decision-analytic framework for the EU. Contextualises the proposed framework in EU’s Energy Union grid design initiatives. This paper proposes a framework with methodologies to assess the electricity independence of the Baltic States, in order to support analysis for the energy policy making. Due to historical and geographical reasons, the Baltic States are strongly interconnected to power transmission grids of Russia and Belarus. Current energy security policies and electricity interconnection targets in the EU trigger the need for studying and implementing alternative electricity supply options and power system configuration schemes for the Baltic countries. To comprehensively assess the electricity independence, we calculated three indices: “adequacy”, “security” and “economic factor”. 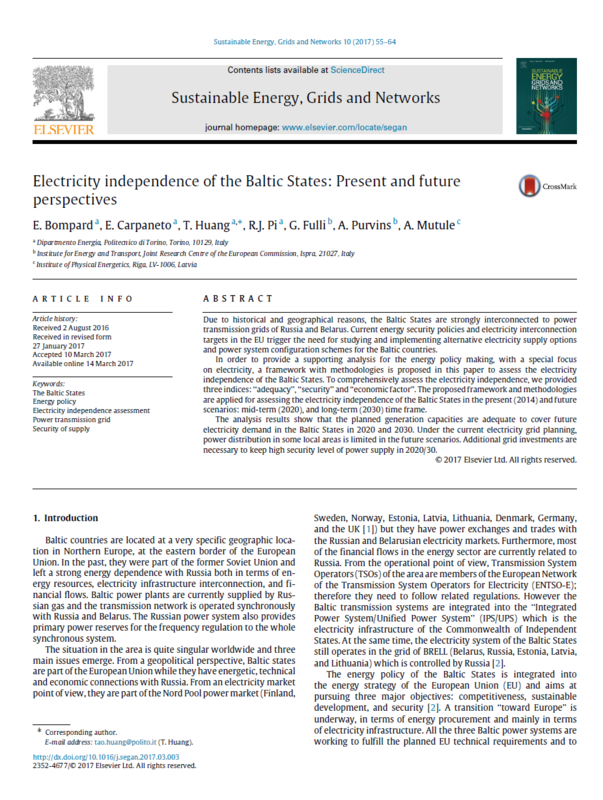 The proposed framework and methodologies are applied for assessing the electricity independence of the Baltic States in the present (2014) and future scenarios: mid-term (2020), and long-term (2030) time frame. The analysis results show that the planned generation capacities are adequate to cover future electricity demand in the Baltic States in 2020 and 2030. Under the current electricity grid planning, power distribution in some local areas is limited in the future scenarios. Additional grid investments are necessary to keep high security level of power supply in 2020/30. 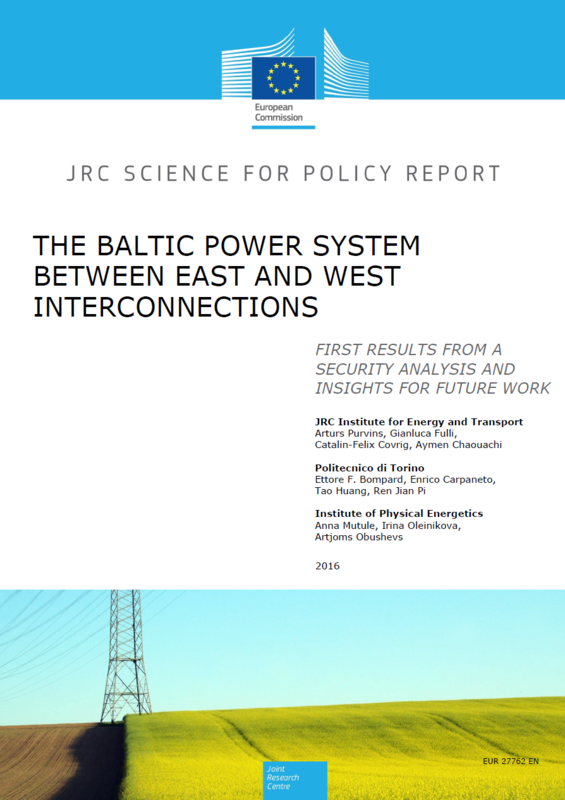 This report is based on a power system model of the Baltic States developed with the purpose of assessing comparative options for a reliable and secure development of the Baltic electricity system. The analysis of horizon 2020 and 2030 showed that the dependency of Baltic States on external resources is fairly low, provided that the expansion of the electricity system proceeds as planned. The study was conducted with the objective of understanding the competitiveness of the three Baltic countries individually, while considering the network infrastructure constraints. To assess options for enhanced energy security, we developed a dedicated power system model covering the 330 kV, 220 kV and 110 kV network and including four scenarios: winter peak, winter off-peak, summer peak and summer off-peak. The foreseen expansion of electricity generation sources in the Baltic countries will result in fairly low dependence on electricity imports by 2020 and 2030. The report shows that Lithuania's network infrastructure is adequate and can sustain a large quantity of imports. The Latvian power system enjoys more market advantages due to the high ratio of renewable energy (mainly hydro) in its electricity generation mix. Estonia relies on its own fossil oil shale and has the highest installed wind turbine capacity among the three Baltic States, but it does not have enough capacity to ensure the same strategic market position of Latvia. Future nuclear generation in Visaginas can greatly improve security of electricity supply in the Baltic States. Even in its absence, the Baltic States can still count on alternatives for power generation, although with a decreased security margin, if not supplemented by other balancing resources (like cross-border interconnections, storage capacity, demand response). 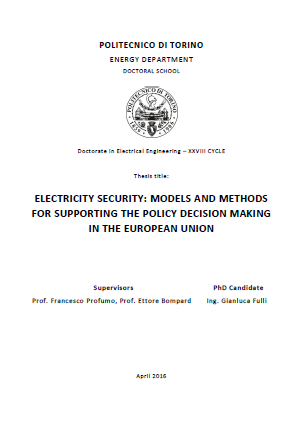 This PhD work aims to contribute at bringing together scientific advice with policy making in the power system security field. 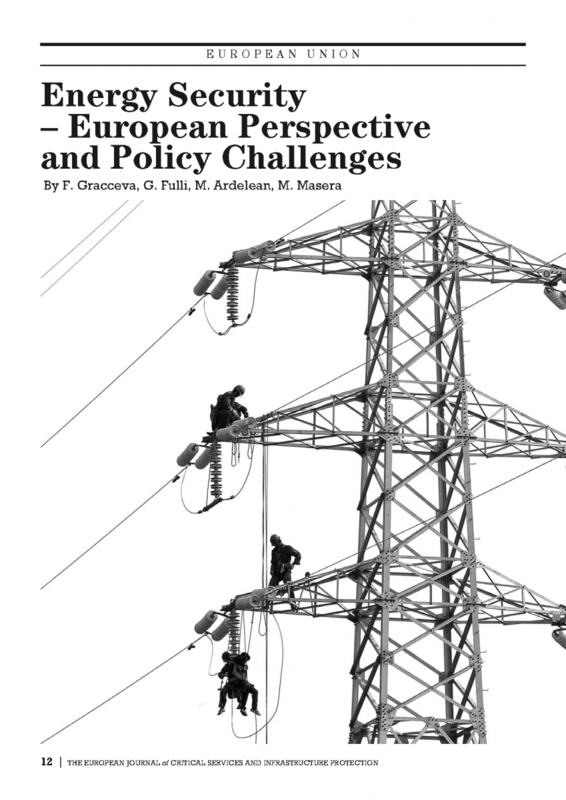 The following research question is formulated and addressed: given the strategic role of electricity and considering the multitude of threats electricity delivery faces in the European Union’s socio-economic and the global geo-political context, how shall power system modelling and assessment methodologies evolve to adequately support the policy decision making on electricity security at EU, regional and national scale? This work aimed to contribute at bringing together scientific advice with policy making in the power system security field. 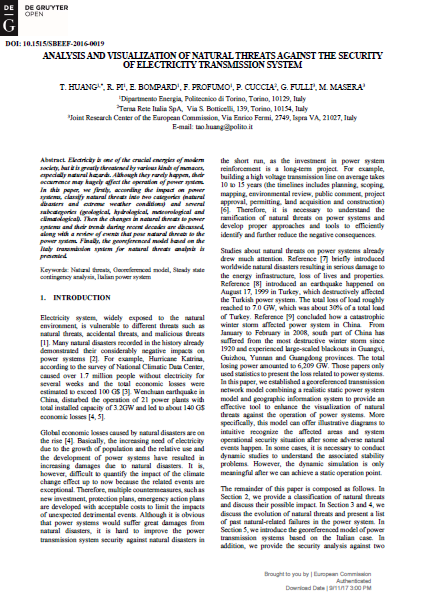 This was mainly done via: a revised taxonomy of energy and electricity security properties, a critical review of models and methodologies for electricity security analyses and a novel decision-analytic framework for electricity security. Aspects for the practical application of the framework at national (Italian), regional (Baltic) and EU scales were analysed and discussed. 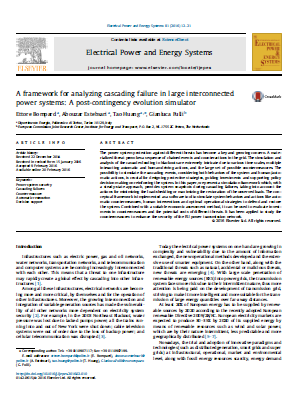 This paper proposes a simulation framework which, with a steady-state approach, provides system snapshots during cascading failures, taking into account the actions for minimizing the load-shedding or maximizing the restoration of the unserved loads. The power system protection against different threats has become a key and growing concern. A materialized threat provokes a sequence of chained events and counteractions in the grid. The simulation and analysis of the cascades leading to blackouts are extremely intricate due to various time scales, multiple interacting automatic and human-driving actions, and the large set of possible countermeasures. The possibility to simulate the cascading events, considering both behaviors of the system and human/automatic actions, is crucial for designing protective strategies, guiding investments and supporting policy decision making on reinforcing the system. The conceptual framework is implemented as a software tool to simulate system behaviors and actions like automatic countermeasures, human interventions and optimal operational strategies to defend and restore the system. Combined with a suitable economic assessment method, it can be used to evaluate investments in countermeasures and the potential costs of different threats. It has been applied to study the countermeasures to enhance the security of the EU power transmission network. 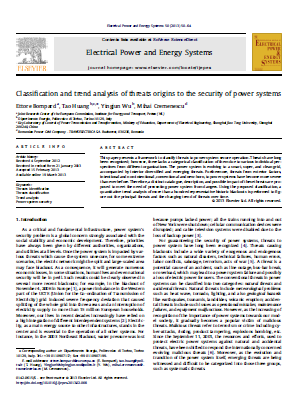 This paper assesses the threats to secure power system operations. Electricity is one of the crucial energies of modern society, but it is greatly threatened by various kinds of menaces, especially natural hazards. Although they rarely happen, their occurrence may hugely affect the operation of power system. To this end, we first classify natural threats into two categories (natural disasters and extreme weather conditions) and several subcategories (geological, hydrological, meteorological and climatological) according to the impact on power systems. Then the changes in natural threats to power systems and their trends during recent decades are discussed, along with a review of events that pose natural threats to the power system. Finally, the georeferenced model based on the Italy transmission system for natural threats analysis is presented. This chapter in the International Handbook Of Energy Security deals with the internal security of the European Union’s gas and electricity grids, laying particular emphasis on future challenges to network stability arising from the liberalisation of the internal market for natural gas, the integration of renewable energy sources in the electricity network and the cyber-security challenges to interconnected energy infrastructures. The Handbook brings together energy security experts to explore the implications of framing the energy debate in security terms, both in respect of the governance of energy systems and the practices associated with energy security. 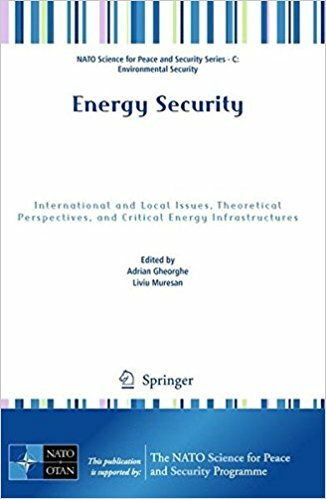 The contributors expertly review and analyse the key aspects and research issues in the emerging field of energy security, test the current state of knowledge, and provide suggestions for reflection and further analysis. This involves providing an account of the multiplicity of discourses and meanings of energy security, and contextualizing them. They also suggest a rewriting of energy security discourses and their representation in purely economic terms. 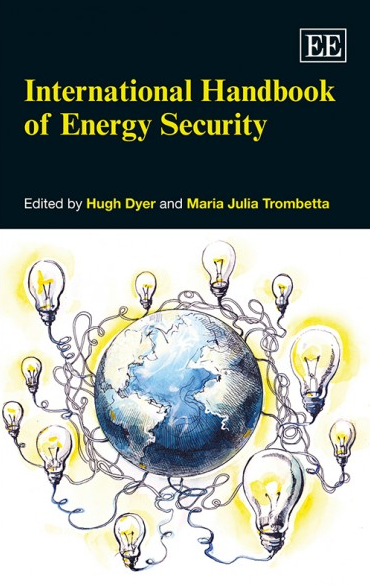 This volume examines energy security and its conceptual and practical challenges from the perspectives of security of supply, security of demand, environmental change and human security. It will prove essential for students in the fields of global, international and national politics of energy, economics, and society as well as engineering. It will also appeal to policy practitioners and anybody interested in keeping the lights on, avoiding climate change, and providing a secure future for humanity. The European Union’s approach towards energy security can be derived from several policy legislations and proposals that followed the European Commission’s 2000 Green Paper “Towards a European Strategy for the Security of Energy Supply”. A central element of the European energy policy is the will to fundamentally change its energy system to a low carbon economy, with the explicit goal of breaking “the cycle of increasing energy consumption, increasing imports, and increasing outflow of wealth created in the EU to pay energy producers” (COM (2008)781). Key elements to reach the three underlying objectives of EU’s new energy and environment policy are the idea of energy security as an issue of common EU concern and further integration of energy markets. This paper presents a framework to classify threats to power system secure operation. Threats have long been recognized; however, there lacks a categorical classification of them due to various individual perspectives from different organizations. The power system is evolving to a smart, super, and clean grid, accompanied by interior diversified and emerging threats. Furthermore, threats from exterior factors, intentional and non-intentional, conventional and new-born, to power systems have become more severe than ever before. Therefore, a distinct catalogue, description, and possible impact of these threats are proposed to meet the need of preventing power system from dangers. Using the proposed classification, a quantitative trend analysis of more than a hundred representative historic blackouts is performed to figure out the principal threats and the changing trend of threats over time. This chapter presents the European Union’s approach towards energy security. In spite of its critical role, energy security lacks a universally agreed definition, which given its complexity may well just be unrealistic. The concept is still used in a wide range of reports and documents, often without discussion of its dimensions and their significance. As a consequence, the literature is characterized by an almost overwhelming focus on securing supplies of primary energy sources and geopolitics. Clearly, views on energy security also differ widely between nations. The European Union’s approach towards energy security is presented in this paper; it can be derived from several policy legislations and proposals that followed the European Commission’s 2000 Green Paper “Towards a European Strategy for the Security of Energy Supply".